God loves you. Because of God’s love for all persons, He desires that you have unbroken fellowship with Him. You are a sinner. All persons are "sinners" in that they disobey God. Sin is choosing to go your own way and do your own thing as opposed to being obedient to God. Sin separates you from God. Sin forms a barrier that prevents you from entering into unbroken fellowship with God, Who is holy. As an unholy sinner, you can’t have fellowship with God. You are headed for a Christless eternity that the Bible calls Hell. You can’t save yourself. People often think that through their efforts they can overcome the sin barrier between themselves and God. That isn’t true. There’s nothing you can do to restore the broken relationship with God. You can’t earn God’s salvation. God sent His son Jesus to remove the sin barrier. What you cannot do for yourself, Jesus Christ has done for you! Your sin is a barrier between you and God. 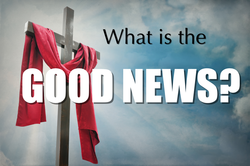 But the Good News is that Jesus died on the cross for you and then rose from the dead to demonstrate that His payment was acceptable to God. By taking your punishment on Himself, Jesus made a way for relationship with God. You can receive Jesus Christ through faith. Faith is trusting in what Jesus has done for you rather than trusting your own efforts to restore fellowship with God. Faith is complete reliance on Christ to put you in right relationship with God, allowing Him to live His life through you. Faith also involves repentance or genuine sorrow for sin and willingness to turn away from sin. What makes the Bible different from other religious books? Salvation is a gift (Ephesians 2:8) that God doesn’t take away (Philippians 1:6). Find a Bible translation you’re comfortable with. Get involved! Join a class or fellowship group to help encourage you.